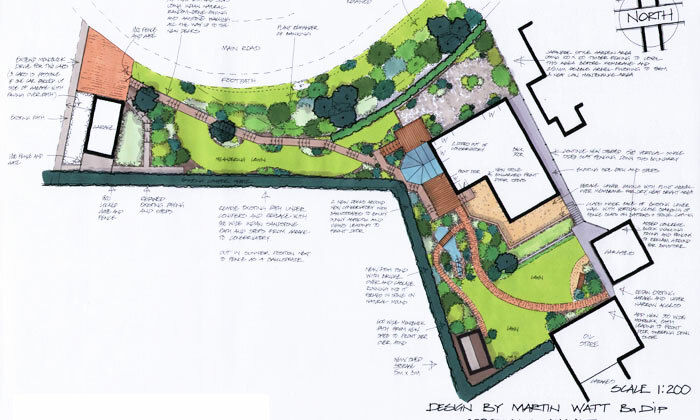 Master plan for a large sloping garden with big water feature. This was a large and very challenging sloping site with many areas that were hard to maintain and relatively un-useable. The client needed a lot of help from me to decide where to allocate the priorities of their budget across the whole property to deal with all the issues and achieve the most enjoyable and attractive lasting results. The client was also having a new elevated conservatory built and needed attractive access and outdoor spaces designed to suit that new feature. An additional part of the brief was to locate and design a large and deep water feature to be a central focal point. The final master plan of the whole property realised all the potential of the garden areas, addressed all the issues and detractors and created a more useable and manageable garden with attractive and functional access. The sheltered outdoor room areas around the conservatory enjoy great views set around the waterfall fish pond and associated planting. This project was a great success and the client was able to do all the works in one phase because it was designed to their budget. The client was delighted with my service, the design and the end result with no build difficulties or additional costs.